Just a general question here. I've always been curious about the "niche" in the Queen's Chamber of the Great Pyramid. It seems so odd. Several books I've read suggest that it was used to house a statue of Khufu, but I've never personally felt that seemed like a good theory. I actually see somewhat of a relationship between the niche and the shape of the Grand Gallery. Is there any current "accepted" theory on the purpose of the niche? Any new ideas regarding this? Somewhere in the internet I saw the old photo of that niche, which has a big hole inside it, as a opening of passage, by I currently know where I found it. Michael Haase : Brennpunkt Giza - Die Schachtsysteme der Cheops-Pyramide. - In: Sokar 5-2. - 2002. - pp. 3 – 13. - (PDF - 1,3 MB). Thanks Lutz for this document, at the 6th page there is picture I saw in the internet. It looks like there is some hole in the niche, but it is not drawn on the diagram. In the middle of the niche is the entry into a crawling tunnel that is 15,30 meters far east into the stonework. Due to its initial symmetry can be assumed that the front area of the tunnel already during the construction of the pyramid was built, and a very specific function within the queens chamber had. Only the second, raw formed, part of the tunnel is an activitie by tomb robbers, which here probably cavities have suspected. Interesting. Today it is closed with wall, isn't it? And in the schematic representation of Queen's chamber, is that a little room (the lowest "cube") under the niche, or it is just an appearing that way? 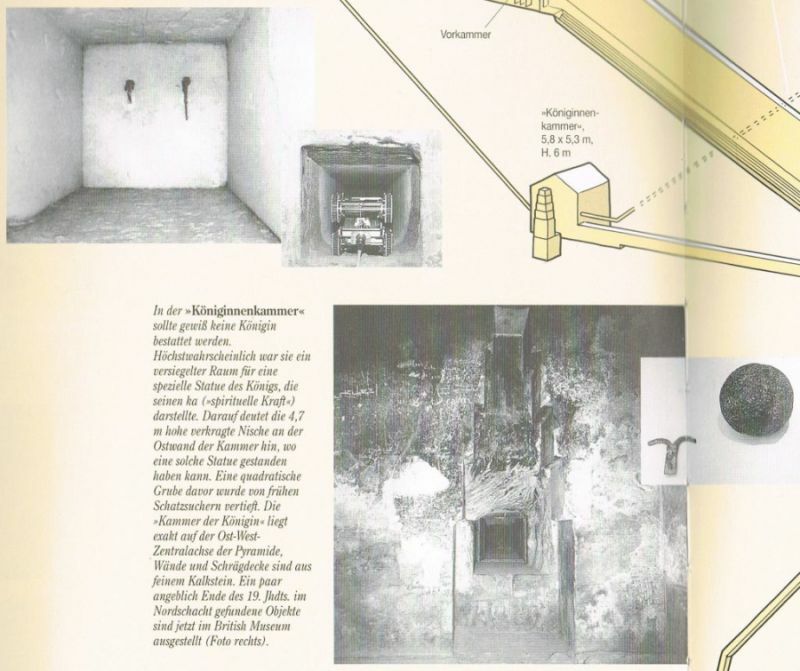 ... And in the schematic representation of Queen's chamber, is that a little room (the lowest "cube") under the niche, or it is just an appearing that way? "The Complete Pyramids". - London : Thames and Hudson, 1997. - ISBN : 0500050848. - 256 p.
... and often still for 2,- € (+ shipping) in shops for used books online to find. Probably confused it with some other shaft closed by wall. Great, that book is very cheap. I should have it. Is there any known reason why it is closed for visitors? Maybe you mean the so called serving or well shaft, starting at the bottom of the great gallery. This one (and also the "air shafts" in the queens chamber) was closed and hidden when the pyramid was entered in modern times. It leads vertically from the core building in several sections to the descending passage, and meets it shortly before the passage opens into the subterranean chamber. One suspects that after closure of the ascending passage from the inside, the workers through this gear went into free. ... Is there any known reason why it is closed for visitors? No, just the every few years taking place investigations of the shafts with robots ... I guess, with the necessary "small money" you could come in. Postscript ... In connection with the project " Scan Pyramids " are currently also investigations inside the large one. For this, devices were also installed in the so called "Queens Chamber". The measurements should help identify potential cavities or still unknown chambers inside the pyramid.